Trinicenter.com - Venezuela and Chávez - Chavismo Lives! Supporters massed in Plaza Bolivar. It's Caracas' main square. 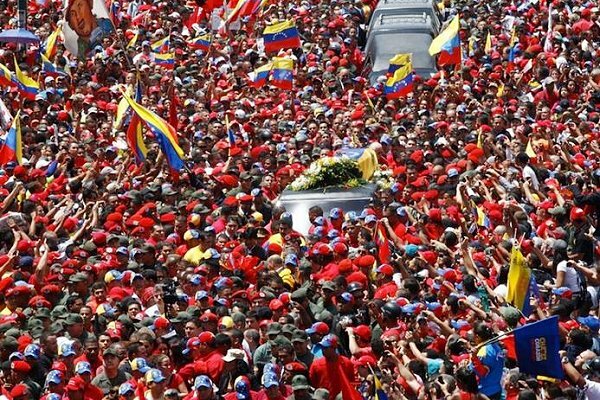 "Chavez vive, la lucha sigue," they chanted. "Chavez lives, the battle continues." "The people united will never be defeated." Oligarchs "will never return" to the Miraflores Palace. Jimmy Carter praised Chavez. He'll "be remembered for his bold assertion of autonomy and independence for Latin American governments and for his formidable communication skills and personal connection with supporters in his country and abroad to whom he gave hope and empowerment," he said. James Petras said he "was loved not only by Venezuelans but throughout Latin America" and elsewhere. He was special. He'll be sorely missed. In his last letter to Maduro, Fidel Castro said "Chavez's name is known and respected throughout the world." He called him the "Olympic champion of new socialist ideas." Chavez called Castro his father, mentor and friend. He's "always been a Quixote," he said, "but a victorious and invincible Quixote." Both men bonded years ago. They met in Havana. They did so in 1994. Chavez sought Castro's advice. Cuba's leader recognized a potentially important new figure. They exchanged ideas for hours. The rest is history. Fidel lives at 86. Chavez passed at 58. His 14-year presidency ended. In 30 days, new elections will be held. New leadership will be chosen. Odds strongly favor Maduro. Chavez named him his preferred successor. Expect Venezuelans to oblige overwhelmingly. They want no part of opposition oligarch rule. He "died in the hours of this Tuesday afternoon." Maduro announced it. He called on Venezuelans "to confront the lamentable death of the President of the Republic 'with much strength, courage and integrity.' "
"We have to be more united than ever, the greatest discipline, the greatest collaboration, the greatest brotherhood and sisterhood," he added. "We are going to grow. We are going to be the worthy sons and daughters of the giant of a man that he was and how Comandante Hugo Chavez will always be in our memory." "The victory of today is the unity of the people and peace." "Respect and peace have to go hand in hand in the immense pain of this historic tragedy which has today touched our country." Maduro urged fortitude and prayer. "From this moment on," he said, "it is forbidden to weep." "With Ali’s song and the spirit of Hugo Chavez, let us raise the greatest forces of this homeland to confront the difficulties it befalls us to confront." "Our people can be assured that they have a government of men and women committed to protect them." "Honor and glory to Hugo Chavez. May he live forever." He had four cancer operations in 18 months. Death came 21 months after his first tumor was discovered. A state funeral is planned. It'll be held Friday. Venezuelans began seven days of mourning. Chavez "led the progressive transformation of Venezuela by lifting millions of its citizens from poverty - standing against social exclusion, marginalization and institutional repression - thereby restoring to them a long-overdue dignity." He improved "the (lives) of ordinary Venezuelans as no other government had ever done in the history of that South American nation." He "played a leading role in the transformation of Latin America into a progressive continent, which in the 21st century is collectively affirming the sovereignty of the nation states that make it up, and where, in different ways and through nationally-specific routes, they have been attempting to build a better world." He'll "continue to symbolize, for decades to come, the aspirations of dignity, sovereignty, justice and a better life as fully empowered citizens, for people all around the world." "He showed that a better world could be constructed." "Our hearts go to his family, friends, comrades, the people of Venezuela, and the people of Latin America." Hands Off Venezuela headlined "Hugo Chavez has died - long live the Venezuelan revolution." HOV defended it for a decade. Chavez said the best way to do it is "to spread it to our own countries." Committed people are obligated to do so. Change comes no other way. Earlier on March 5, government and military officials met. They took preventative steps. They instituted measures against potential destabilization and sabotage. They expelled Washington's attache and his aide. They were up to no good. They contacted Venezuelan military personnel surreptitiously. They did so "with the aim of organizing a conspiracy against the democratically elected government." Washington conspired for years to oust Chavez. He believed America wanted him dead. He once said "If they kill me, there will be a really guilty party on this planet whose name is the president of the United States." He had Bush in mind. He knew Obama's no different. "I will not hide," he said. "I'm going in the streets with you. I entrust myself to God, but I know that I have been condemned to die." Castro also named America earlier. "If Chavez is assassinated," he said, "the blame will fall on Bush. I say that as someone who has survived hundreds of the empire's (venal) plans." Obama exceeds the worst of Bush. Perhaps he marked Chavez for death. It wouldn't surprise. He's a war criminal multiple times over. He's guilty of high crimes. He's waging war on humanity. He's beholden to monied interests. They own him. In 2011, Chavez suggested Washington's responsibility for a "very strange" bout of cancer. It affected Latin American leaders. Argentina’s Cristina Fernandez de Kirchner's thyroid cancer was confirmed. Former Brazilian President Lula Da Silva had throat cancer. Current President Dilma Rousseff battled axillar lymphoma. Others affected included Colombia's Juan Manuel Santos (prostate cancer), and Paraguay's Fernando Lugo (lymphatic cancer). Last June, Washington's dirty hands ousted him. A parliamentary coup replaced him. America targets all independent leaders. Since taking office, Chavez knew what he faced. He survived an aborted April 2002 two-day coup, a 2002-03 general strike and oil management lockout, and failed August 2004 recall election. "Would it be so strange that they've invented the technology to spread cancer and we won't know about it for 50 years?" "Fidel always told me (to) take care. These people have developed technologies," he said. "Take care what you eat, what they give you to eat. They inject you with I don't know what." On state television, Maduro said a "scientific commission" would examine Chavez's death. "(H)istorical enemies" wanted him removed. He left no doubt who he meant. Washington's long arm targeted him. It did so from inception. Its rap sheet includes numerous assassinations and coups. Perhaps Chavez is America's latest victim. It's the oil, stupid. Venezuela has the world's largest reserves. Washington wants total control. CIA assassins never rest. They have other targets in mind. Before they're old enough to understand, US children are taught to "pledge allegiance to the flag of the United States of America and to the Republic for which it stands." They're weaned on misinformation. What they most need to know, they're not taught. America's ugly history is sanitized. Its worst parts are omitted. It's a government largely of men, not laws. They lie, cheat, connive, and abuse rule of law principles. They do so ruthlessly. They do it for monied interests they serve. They profit hugely in the process. America was never a democracy. It's not one now. "We the people" include wealth and powerful interests alone. It's been that way from inception. Believing otherwise is fantasy. America's founders today would be called a Wall Street crowd. They included bankers, lawyers, politicians, merchants, property owners, and likeminded self-servers. They crafted what best suited them. Ordinary people were out of sight and mind. Things today are far worse than ever. Rogue state government rules. Populism's a dead letter. Wealth, power, privilege and dominance alone matter. Tyranny's a hair's breath away. Rule of law protections are null and void. Neoliberal harshness is policy. Venezuela is polar opposite. Bolivarianism is policy. Chavez institutionalized it. He deserves full credit. He went where few leaders ever dared. He risked his life doing so. He lasted 14 years. He died for what he believed. He instituted benefits Venezuelans won't surrender. He let them choose. He did it by national referenda. They agreed to constitutional change. They did so overwhelmingly. Their lives improved enormously. They got participatory social democracy. They have final say. They have free, fair and open elections. Jimmy Carter calls them the world's best. America's are farcical by comparison. Duopoly power controls things. People have no say. All Venezuelans are guaranteed suffrage at birth. It's constitutionally mandated. They're automatically registered free of charge. They have government of, by and for everyone. They're beholden to rule of law principles. Police state laws are verboten. Democratic ones rule. No one's above the law. Democracies operate that way. Venezuelans get benefits Americans can't imagine. Venezuela's oil wealth provides them. They include education to the highest levels, quality healthcare, subsidized food and housing, land reform, respect for indigenous rights, job training, micro credit, affordable electricity and cooking gas, gasoline at 5 cents a liter, and other social, economic, and political benefits. Americans get neoliberal harshness, force-fed austerity, growing poverty, high unemployment, unaddressed homelessness and hunger, and a government beholden solely to wealth and powerful interests. Chavez institutionalized change. Major ones take time. He planned so much more. Maduro's entrusted to continue what he began. America's unfit to live in. Wealth, privilege and power are prioritized. Police state laws govern. Bipartisan complicity plans much worse ahead. Venezuelans are governed by officials who care. It makes a difference. Maduro's entrusted to continue Chavez's mandate. Hopefully he's up to the challenge. His background suggests so. He's a former uni0n leader, legislator, National Assembly Speaker and Foreign Minister. He's now interim President. He's charged with preserving Chavez's legacy. Hopefully he'll improve it. Venezuelans expect no less. In the fullness of time we'll know. Stephen Lendman lives in Chicago. He can be reached at lendmanstephen@sbcglobal.net. His new book is titled "Banker Occupation: Waging Financial War on Humanity." Visit his blog site at sjlendman.blogspot.com.